For those who think that terrorism is a recent development, Soulpepper’s production of Albert Camus’s 1949 play The Just (Les Justes) will be quite instructive. Camus’s play is based on the assassination in 1905 of Grand Duke Sergei Alexandrovich of Russia by the SR Combat Organization, the terrorist branch of the Social Revolutionary Party of Russia. Using Memoirs of Terrorist (1917) by Boris Savinkov as his source, all but one of the main characters is based on an historical figure. Camus, thus, is able to take us inside a terrorist cell where we discover that debates about the use of terror to further political ends have barely changed. The Grand Duke, Commander of the Moscow military district, was chosen as a target by the terrorists because of his harsh suppression of dissent, more severe, in fact, than that of his uncle Tsar Nicholas I. Following history very closely, Camus shows the prelude and aftermath of the the terrorists’ first failed attempt to kill the Grand Duke as he travels by coach to the Bolshoi Theatre and their second successful attempt when he visits the theatre again two days later. Boris Annenkov (Diego Matamoros) is the SR Party leader who decides which of the group will throw the bomb. Ivan Kaliayev, known as Yanek (Gregory Prest) is a new member of the group who wishes to give his life for the cause. Dora Doulebov (Raquel Duffy) is his former lover whose scientific training gives her the knowledge of how to make bombs. And Alexis Voinov (Peter Fernandez) is a former student who was thrown out of university for making anti-tsarist comments. The one fictional character is Stepan Fedorov (Brendan Wall), a man who spent three years in prison as a revolutionary. Camus introduces him as a man whose years in prison have made him an extremist. He has no qualms about killing innocent people, even women and children, to ignite a revolution. He even asks Dora how many bombs it would take to blow up all of Moscow. Compared to Stepan’s view, Boris’s notion of assassinating only a single man in power seems scrupulous and conservative. As one might expect from a writer better known as a philosopher and novelist, The Just is a play of ideas. In the classical manner all physical action is kept off stage while the onstage stage action consists of debates among the terrorists of what their goals as individuals and as a group are and should be. Audiences will likely be surprised by how Stepan’s extremist views, shunned by the others, are so much like those of modern terrorists. Though none of the terrorists in Camus have religious motives, Stepan would be happy if terrorist actions brought about an apocalypse so that the world would have to start all over again. The one thing Camus does not do is to create a character parallel to Stepan on the other side. It is taken for granted by all the characters that killing the Grand Duke is a good and just action that will lead to positive change for Russia. Missing is a voice to ask whether killing one man who is part of an entire repressive military regime actually has any point, whether an assassination will not, in fact, cause the regime to become more rather than less repressive. Since no one in the play is forced to answer these fundamental questions, the audience is necessarily distanced from characters whose primary motivation is one it cannot identify with. To make matter more difficult, Camus gives us next to no information about the lives of his characters. He allows us to know the characters only in relation to the Party but nothing else. As a result they and their actions seem rather too abstract. At least Shaw leavens his plays of ideas with humour and Brecht leavens his with both humour and theatricality. Camus, however, seems convinced that the situation itself will generate sufficient tension and the the debates sufficient drama to engage an audience with the play. This turns out not to be true. We may be intellectually engaged with the arguments for and against more extreme forms of terrorism, but if we are not engaged with the characters emotionally we are not fully engaged in the play. Because of this we don’t really care what does or doesn’t happen to the Grand Duke or even to his assassin. that through their own single-minded dedication to freedom the terrorists have denied themselves freedom to imprison themselves in a “cause”. Gregory Prest gives an exceptionally fine performance as Yanek and is able to give variety to the character’s frequent avowals of his dedication to the cause. We wish Camus had written more that one short exchange between Yanek and Dora so that we could learn more about both of them before love for the cause came to dominate love for each other. Raquel Duffy brings Dora, perhaps the play’s most multi-layered character, vividly to life. She shows Dora’s earnestness and determination as well as love for Yanek, repulsion at Stepan’s extremism and bravery in bracing herself to learn the worst. Diego Matamoros, unsurprisingly, is excellent in distinguishing his two characters – the mastermind Boris, rational and authoritative, from the secret police chief Skuratov, who uses false compassion like a cat playing with its victim. Both Brendan Wall as Stepan and the Guard and Peter Fernandes as Voinov and a fellow prisoner could enunciate more clearly. Fernandes makes his demoralized prisoner quite distinct from his frightened student. As Stepan, Wall radiates the intensity of a man who wants to destroy the world that destroyed him, but he needs to vary the harsh, dry tone of his outrage to give us some glimpse of the man Stepan was before he became so obsessed. Camus included a remarkable scene in the second act when the Grand Duchess Elizabeth Feodorovna, widow of the Grand Duke Sergei Alexandrovich, comes to visit Yanek in prison to see the man who killed her husband. The deeply religious Grand Duchess retired to a convent she founded after her husband’s death to do good works for the poor of Moscow. Camus doubtless includes her to represent the temptation to turn to religion when confronted by the inequities of the world, a temptation that Yanek as the most religious of the terrorists must resist. This might have been a powerful scene except that the terribly miscast Katherine Gaulthier brings absolutely nothing to the role. With an uninflected voice and face devoid of expression, she gives no hint either of the Grand Duchess’s suffering or of the balm religion gives her. This might have been the scene that would elevate the play out of the realm of dry realism, but Gaulthier makes it simply a pointless peculiarity. Those familiar with Camus as a philosopher and novelist will know that Camus wrote The Just two years after he wrote his great novel La Peste (The Plague). In that novel Camus turned away from the nihilism that he expressed in his famous novel L’Étranger (The Stranger) of 1942. In La Peste life is still viewed as without meaning, but murder as well as suicide are therefore even more meaningless. Camus shows that human beings can give life purpose by dedicating themselves to helping other get through life. In The Just the question is whether the terrorists are doing more good by killing one tyrant who can be replaced by another than the Grand Duchess who dedicates her life to succouring the poor and suffering. As a former member of the French Resistance, Camus would have been writing for an audience that would themselves have been divided over the question of using violence to achieve freedom. With a present-day audience who lets other people, or machines, fight causes for them, Camus’s arguments will strike us as surprising relevant but will not be enough to make an emotionally satisfying drama. 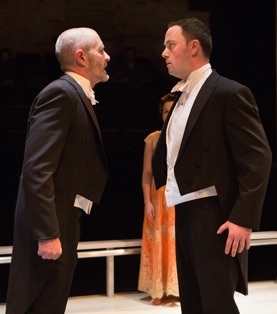 Frank Cox-O’Connell has made the most of the play with the cast he was given, but one wonders whether such an intellectual play needs even more of the kind of startling theatricality Cox-O’Connell has used to bring it more fully to life. Photos: (from top) Diego Matamoros and Raquel Duffy; Brendan Wall and Gregory Prest. ©2016 Cylla von Tiedemann.